Matthew chapter 3 and verse 4 affords a brief look at John The Baptist himself. He seems to have been very much a man. The circumstances under which he grew to manhood would naturally tend to build a strong, sturdy physical appearance. in keeping with his raiment of camel's hair. His simple diet of locusts and wild honey shows his ascetic taste, his practice of self denial due to his dedication to his vocation God had called him to. As a Nazarite, under the vow the Nazarites carried, he would of necessity have been a man of plain and simple living. He carried a deep burden for his people, a nation lost in sin. He saw the exceeding sinfulness of the religious people of his day, and he called upon them to do penance. His language was plain and not to be misunderstood, for he called the religious leaders hypocrites and vipers. Sound familiar? The religious people and the religious leaders he spoke to sound like your average Catholic and many if not most of your Catholic clergy!...lost in sin, hypocrites, and vipers. And all of them for the most part thinking they are good people, but in reality need to do penance! Then went out to him Jerusalem and all Judea, and all the country about Jordan: And were baptized by him in the Jordan, confessing their sins. It was prophesied in the Old Testament book of Malachi 4:5 that God would send Elijah the prophet to announce the coming of Messiah and prepare the people for that event. The Angel in Luke 1:17 explained that John the Baptist in the spirit of Elijah, was the fulfillment of that prophecy. This was also declared by Jesus Himself. The ministry of Elijah and the ministry of John consisted mainly in stern reproof of sin and exhortation to repentance. Oh how we need that kind of exhortation behind our pulpits. And I am not talking about sins of the world as much as I am talking about the sins of the everyday lay person in the pew. We spend so much time preaching that abortion is a sin at our masses, and it definitely is, but whats is the point? We are preaching to the choir as it were. We are preaching to a pew full of people who for the most part already understand that it is a sin. How about reproving them of the sin of Gossip, Slander, birth control, hypocrisy, the ungodly things they listen to and watch on TV and there computers, etc., the kind of sins that people in the pews are really dealing with. Someone one may say, “stern reproof of sin and exhortation to repentance does not work anymore. People are more sophisticated, we must reason with them in a logical educational way.” No, people today are just as sinful and wicked in their heart as they ever were. In fact Jesus said that in the end times people would be just as bad as they were in the day of Noah! Stern reproof of sin is what is needed when preaching, exhortation to repentance needs to be the cry that every Priest proclaims! Now Elijah Is described as a hairy man in II Kings 1:8 , and many Old Testament authorities believe the meaning to be that he wore a garment made of hair. Elijah also wore a leather girdle. Dressed in this unusual clothing, he stood before a weak, spineless, self-indulgent king and spoke harsh words of stern reproof. I have know doubt that the king believed Elijah to have been sent from Almighty God. John the Baptist, speaking in the spirit and power of Elijah, was no doubt equally convincing as to his calling and his purpose. According to Zachariah 13 verse 14 false prophets hypocritically wore rough garments, the type of clothing worn by the prophets of God, in order to deceive the people. We have the same thing happening today. We have men who wear collars, cassocks, and habits who are being used by Satan to deceive the people. Oh they may be sincere and likable, but they are sincerely wrong and hate the truth handed down to us from the Church. John the Baptist was not like that. He was not imitating Elijah or anyone else. His dress and his diet, as well as his calling and message was from the Lord. However, in many ways he was like Elijah, and he was not afraid of man. John the Baptist very plainly told King Herod that he was living in adultery because he had taken his brother Philip's wife, Herodias. Such bold preaching cost John his life, for Herod had him arrested and imprisoned! John is a far cry from many of today's spiritual leaders in the Church who allow annulments to be given out like it was candy at Easter. Later King Herod ordered John the Baptist to be beheaded and his head was brought on a silver platter and presented to Herodias' daughter Salome, and through her to Herodias. The prophet Elijah was a man of power. 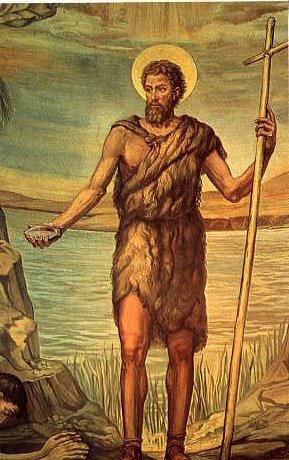 John the Baptist was a man of power, I think both physical and of course spiritual, and he did not hesitate to declare the whole counsel of God. He was like Elijah in another respect: he did not write any books. He left history to be recorded by others. The people who came to hear John the Baptist came out from Jerusalem...” Centuries had passed since a prophet had appeared and the Jews longed for prophetic guidance. They grew extremely excited when John the Baptist appeared, crying out “Do Penance! For the Kingdom of Heaven is at hand.” The Jewish nation was expecting the appearance of a prophet. Some believed that Jeremiah would come Some thought Elijah would return. Others were looking for a prophet like unto Moses. Then the report spread far and wide that a prophet had appeared, a prophet dressed like Elijah and preached like Elijah. This might be the Messiah or at least the forerunner of Messiah. He was preaching penance, he was preaching that the kingdom of Heaven was at hand, he was delivering a message such as had been delivered by the prophet of God in the days of the Israelite fathers. It is any wonder that excitement prevailed from far and near to the place where John the Baptist was preaching? They came from Jerusalem, and from all the region or country around about Jordan. Not only did people come from all over Judea to hear John's message, but according to the Gospel of John we know that some people came even from Galilee. This of course was at a later period when John was preaching and baptizing further up the river Jordan. When proselytes were admitted to the Jewish faith in the days just before the appearing of John the Baptist, three rites were performed: Circumcision, Baptism, and Oblation-that is a solemn offering presented to God. These were the rites for men. For women proselytes the rites were two. Baptism and Oblation. Baptism was administered by immersion. That is what the word here in John means. The Greek word means to become fully wet.....fully covered. The meaning has nothing to do with how a baptism is done but what is accomplished when baptized. For instance. I could be immersed in water and get fully wet. But I could also have water poured on me....say like a shower or if I get rained on. In all three cases I got baptized....I got fully wet. But as we said, in the case of Johns baptism it was administered by immersion. The baptism of John the Baptist resembled the proselyte baptism in outward form, but the scriptures make it very clear that John's baptism had far more meaning. John the Baptist said that although they were being baptized with water, there was another baptism coming and that baptism was the baptism with the Holy Ghost and with fire, which we see in the book of Acts on the day of Pentecost.